I made this card for the latest Lawnscaping Challenge to make a card using "critter" stamps. 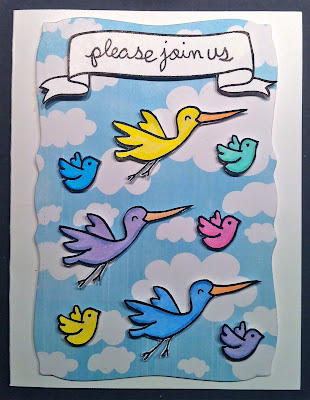 I chose to use these cute birds from Lawn Fawn stamps. I think it's a cute, fun little card. So cute! I love the scene with the flock of birds and all the clouds! Really adorable! I love this. Thanks so much for playing with us at Lawnscaping! So very cute!!!! Love how you added birds from different sets to this card! Thanks again for joining us! How super sweet! Thanks for playing along with us at Lawnscaping!